The background to the King's historic visit to Scotland, the only time he was in the UK. 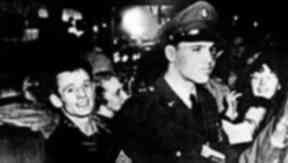 Elvis was finishing his American army national service and was in Ayrshire for just under two hours while his DC-7 aircraft stopped for refuelling. At the time, Prestwick was home for the 1631 USAF unit and was a convenient stopover point for aircraft travelling from mainland Europe to North America. Sgt Presley, as he became, had been drafted to the army in 1958. At the time the US operated a draft system of national service, where young men were expected to serve for two years on active duty and four years in the reserves. By 1958, Elvis was already a massive star. Between January 1956 and November 1957, he was at the number one position on the US Billboard pop chart for a total of 51 weeks. With rock 'n' roll still very much in its infancy, there was concern that such a lengthy break could finish his career. His management ensured he recorded a collection of songs before he joined the army, to ensure a stream of releases while he was out of the public eye. During his time in the army, he had ten top 40 hits with material recorded beforehand. Earlier recordings were also repackaged on albums such as For LP Fans Only, A Date With Elvis, and Elvis Golden Records. Although his entry had been delayed to allow him to finish filming his fourth movie King Creole, he insisted on getting no special treatment during his time in the army, wanting to serve as a regular GI. He turned down a suggestion that he work for army recruitment. After training in Arkansas and Texas, his unit was stationed in Friedberg in Germany. The US was not involved in any conflict at the time, but Presley served as any soldier, and was expected to be proficient in use of weapons and went on manoeuvres with the unit. His military career saw him promoted to the rank of sergeant, and it was during his time in Germany that he began dating Priscilla Beaulieu, the 14-year-old daughter of a US Army captain, who he would later marry. He returned to the US at the end of his time in Germany, flying by a military transport plane from the Rhine Main airbase to the McGuire Air Force Base in New Jersey. It was during a refuelling stop on this flight that Elvis made his memorable visit to Scotland. Despite the information about his visit and flight being restricted - even other passengers on the plane were not initially aware that he was on board - rumours that Elvis was arriving in Scotland soon leaked out. Many in the community were close to those who worked in the base, and a secret as like a visit by one of the biggest stars on the planet was not something that was not easy to keep under wraps. Hundreds of fans gathered at the scene to greet the arrival of his plane, many getting autographs and shaking his hand. The event must have seemed almost unbelievable, with America and even Germany seeming far more distant in those days, and celebrities far more distant still. Anne Murphy was one of the local fans who was there and speaking to STV news in 2000 she said: "The plane came in, the steps went up, the door opened and Elvis appeared, it was just beautiful, he was so handsome and we all went aaaahhhh! "He asked 'Where am I? 'and we all shouted 'Scotland!" While in the country, he briefly spoke to journalists, saying: "I kind of like the idea of Scotland. I'm going to do a European tour and Scotland will certainly be on my list." The promised tour and the Scottish dates were, of course, never to happen. Elvis was honourably discharged from the US army on March 5 1960. He quickly recorded a new collection of songs, including It's now or never and Are you lonesome tonight? and a TV special with Frank Sinatra. The movie 'GI Blues' would soon follow. By serving his country, Elvis quietly won over the press and public that had previously resisted rock 'n' roll. His career was re-launched to even greater commercial success, and he was to become the biggest star popular music would ever know. But for many, it was a brief visit to Scotland that would always be the highlight of his career.